Synthetic and imitation diamonds were produced successfully in the 1950’s by American and Swedish researchers almost simultaneously. Since then, the production has increased by leaps and bounds and current statistics reveal that around 80 tons of these gems are synthesized every year for industrial firms by companies like De Beers, General Electric and others. However, synthetic and imitation diamonds that are large enough to be used in jewelry have been produced more recently, in 2004. To date, two dependable methods exist for creating these larger synthetic and imitation diamonds. In one method, a smaller diamond is used as a ‘seed’ and then molten graphite is added to it under tremendous temperature and pressure until the crystal becomes larger. The second method for producing synthetic and imitation diamonds is known as CVD or chemical vapor deposition. In this method, there is a vacuum chamber in which tiny diamond pieces precipitate and condense in layers, forming a solid deposit. So now we know that synthetic and imitation diamonds are created in laboratories by engineers instead of originating in mines and then being cut and polished by expert jewellers. However, the synthetic and imitation diamonds are almost chemically identical to mined or ‘original’ diamonds. This trend of ‘growing’ synthetic and imitation diamonds has impacted the diamond industry worldwide in more ways than one. Controversies continue to rage, with people supporting both the pros and the cons passionately. But what does all this mean to you, as a consumer? A lot, if you come to think of it. But first you need to understand the distinction between synthetic and imitation diamonds and ‘simulated’ diamonds like moissanite and cubic zirconia or YAG (yttrium aluminum garnet). These simulated gems only resemble the natural diamond in appearance but don’t have the same chemical properties. On the other hand, synthetic and imitation diamonds are just about the same – so far as color, cut or clarity is concerned – as the diamonds that are mined from underground. It’s virtually impossible to tell the difference between the two, and even certified gemologists have to make use of scientific testing equipment for this purpose. Why should you buy artificial diamonds? On a more practical note, synthetic diamonds and imitation diamonds might make sense in certain cases. For one thing, they are sometimes less expensive than natural diamonds. You get something that looks the same elegance, fire and brilliance in your jewelry but at the same time nothing wears like a real diamond. It is important to note that with internet retailers like Novori, real diamonds have become much more affordable and can fit any budget. At the same time the production costs of synthetic diamonds and gemstones has risen dramaticaly. So why buy a fake when you can afford the real thing? Wearing a real, natural diamond is part of the true symbol of love. Most ladies love to brag and show their rings to friends and love to share details of their ring. There is nothing worse than to have to say "It's a fake". There is nothing more empowering than wearing original and natural diamond jewelry. So when you go for synthetic and imitation diamonds, you can look good in your diamond rings, necklaces and bracelets but the true meaning of the diamond is somewhat lost. If you still can’t make up your mind in favor of synthetic and imitation diamonds, here’s one great fact you ought to know. Most diamonds sold in the world are real diamonds. Women today want a real diamond and with todays low prices you to can afford a real diamond. Why settle for something less? 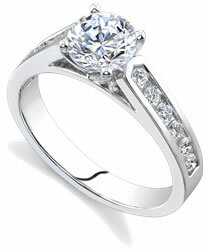 Call Novori toll free and we will help you find a real diamond in your price range. Novori sells only natural diamonds that are certified at indepenent laboratories and natural diamonds that have not been treated or enhanced in any way. So, why not get for yourself or give your beloved the gift of everlasting, perfect beauty at a price that will have you smiling all the way to the bank? Real diamonds from Novori, certified and conflict free are affordable for any budget. Yes, synthetic and imitation diamonds are definitely a new-age rage; but real diamonds are the ones she will love.